Asian Quinoa Salad – a flavorful quinoa salad with colorful vegetables, tossed in a ginger sesame dressing, along with Lorissa’s Kitchen premium protein snacks, is the perfect pairing for a healthy, delicious, on-the-go snack. I love to lead an active lifestyle, I’m an avid runner and enjoy going on long hikes on the beautiful trails here in Massachusetts as well as near our lake house in Vermont. Plus, I have three busy young kids and am constantly on-the-go taking them to their various activities. So, it is essential that I have some healthy and delicious, portable snack options, that keep me going and don’t weigh me down. I look for snacks that taste great, are high in protein, low in fat and low in carbs, such as Lorissa’s Kitchen products. Lorissa’s Kitchen premium protein snacks come in a variety of delicious flavors including Korean Barbeque Beef, Sweet Chili Pork and Szechuan Peppercorn Beef. 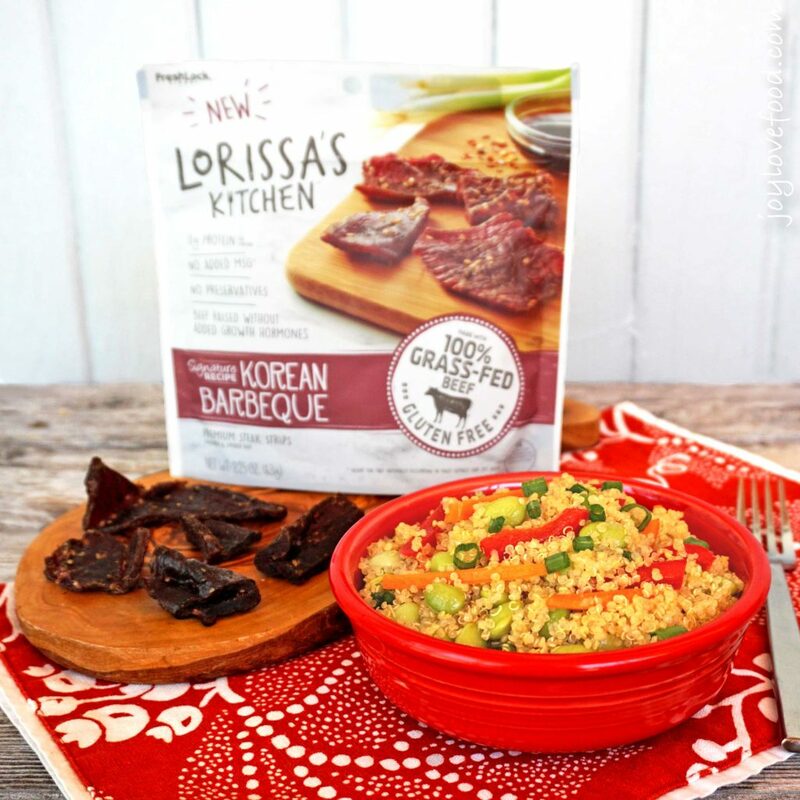 Best of all, Lorissa’s Kitchen uses 100% grass-fed beef and responsibly raised pork, so these are snacks that I can feel good about enjoying. I found Lorissa’s Kitchen products at Walmart, they are located in the checkout lanes. 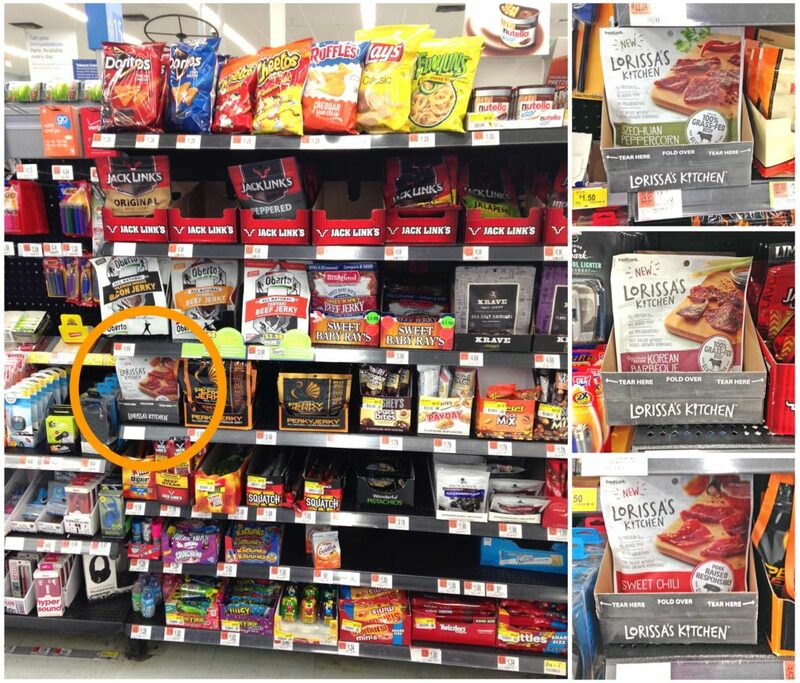 The Walmart I shopped at, has three checkout lanes, I found a different variety of Lorissa’s Kitchen premium protein snacks in each lane, and purchased a package of the Szechuan Peppercorn Beef, Korean Barbeque Beef and Sweet Chili Pork flavors. From now until May 20, 2016, you can enter the Lorissa’s Kitchen #SavvySnackingSweepstakes below for your chance to win a $100 Walmart gift card! There are four ways to enter, be sure to come back and enter daily to increase your chances! Another of my favorite go-to healthy snack options is quinoa salad. I like to make a big batch of quinoa salad and package it into individual serving sizes in portable containers and store them in my refrigerator. That way, I can toss a container in my bag for a healthy snack when I’m going for a hike or just running the kids around to their activities. 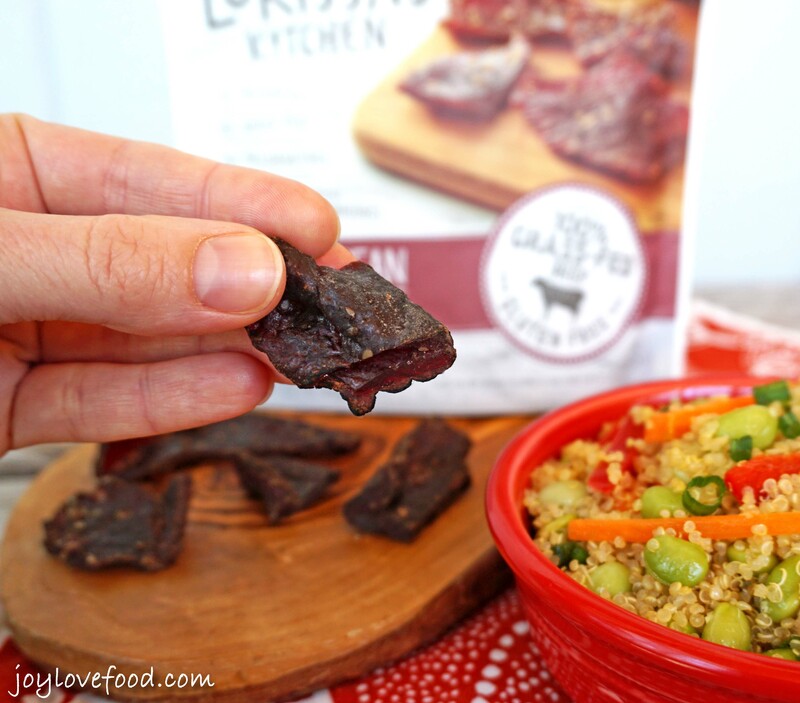 I thought a quinoa salad would be the perfect pairing with the Lorissa’s Kitchen premium protein snacks. I decided to first make a quinoa salad to pair with the Korean Barbeque Beef flavor, which is made with ingredients I have in my own kitchen including soy sauce, brown sugar, white onion and garlic. I thought an Asian Quinoa Salad would pair nicely with those flavors. 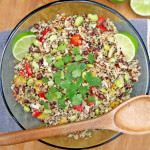 This Asian Quinoa Salad is so easy to make, I first prepare the quinoa according to the package directions. When the quinoa is finished cooking, I fluff it with a fork and set it aside to cool. Next, I gather and prepare the other ingredients for the salad including julienned carrots and red bell pepper, sliced green onions and shelled edamame. I then prepare the ginger sesame dressing by whisking together, in a large mixing bowl, olive oil, sesame oil, rice vinegar, minced fresh ginger, toasted sesame seeds, soy sauce and honey. I add the cooled quinoa along with the other salad ingredients to the dressing and toss to combine. And, that’s it, this delicious Asian Quinoa Salad is ready. It can be served right away or stored in the refrigerator. I like to package this quinoa salad into individual portioned containers and store them in my refrigerator to have on hand for an easy, healthy snack or to toss in my bag when I’m on-the-go. Ginger and sesame is one of my favorite dressing flavor combinations and it goes so well with the nutty quinoa and all the vegetables in this delicious and colorful Asian Quinoa Salad. This flavorful Asian Quinoa Salad pairs so nicely with the Lorissa’s Kitchen Korean Barbeque Beef, together they are the perfect pairing for a healthy and satisfying snack, that is packed with protein and keeps me going. 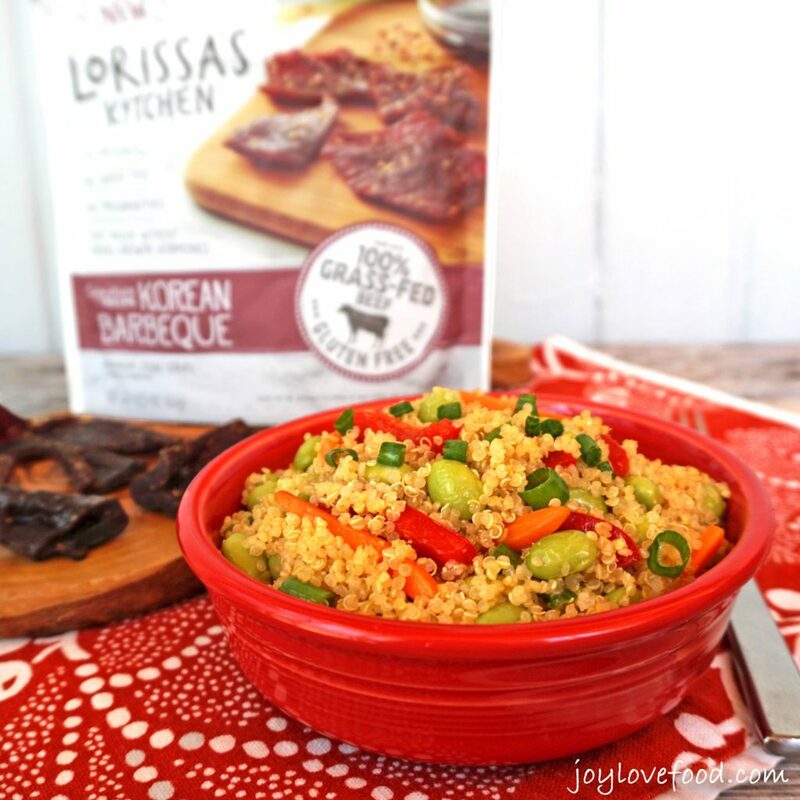 Lorissa’s Kitchen Korean Barbeque Beef along with a container of Asian Quinoa Salad is a great snack for enjoying after a run, taking on a hike or just when I’m on-the-go, running the kids around to their various activities. 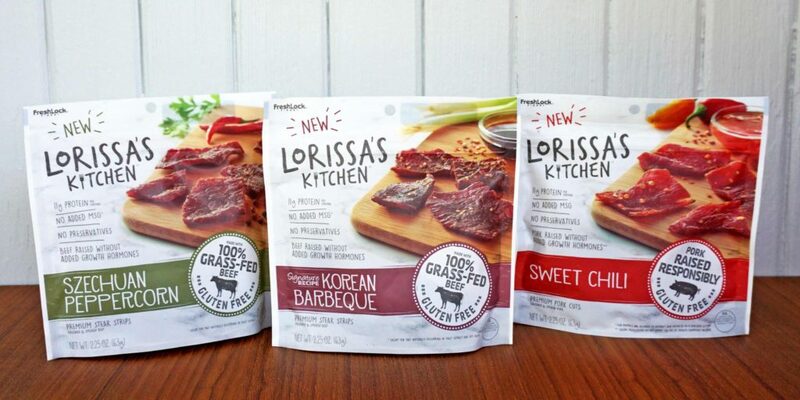 I love that Lorissa’s Kitchen premium protein snacks are made with 100% grass-fed beef and responsibly raised pork, so that I can enjoy amazing, farm-to-table flavor without compromise. 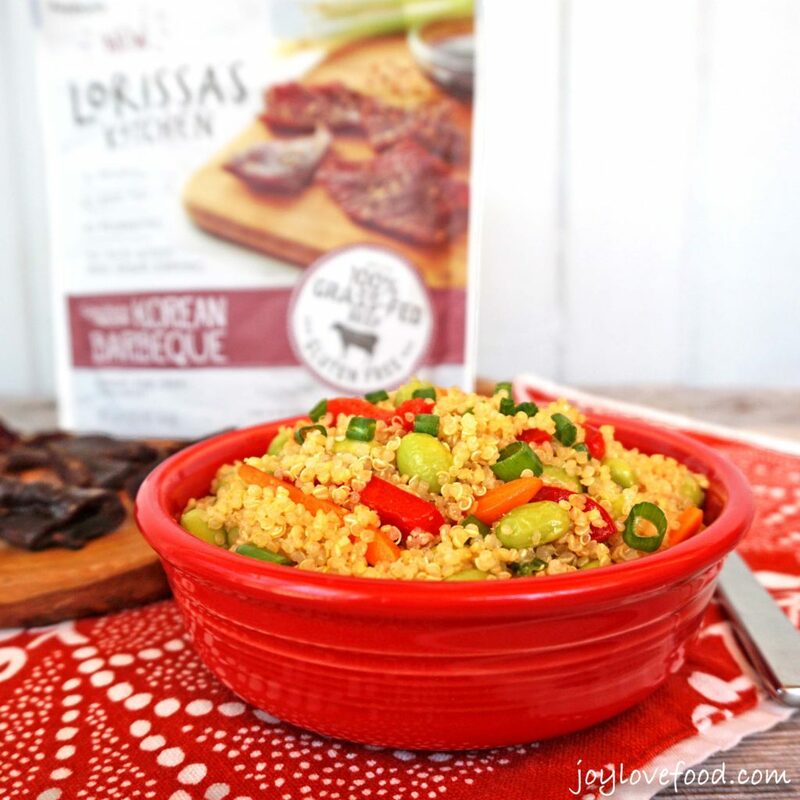 This delicious Asian Quinoa Salad, with all the colorful veggies and ginger sesame dressing, along with Lorissa’s Kitchen Korean Barbeque Beef is perfect for a healthy and satisfying snack, post workout, on-the-go or anytime. What is your favorite healthy, on-the-go snack? Please let me know in the comments below! And, for more information about Lorissa’s Kitchen, including recipes and their latest news, be sure to visit their website and follow them on Instagram, Facebook and Twitter. 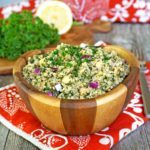 Asian Quinoa Salad - a flavorful quinoa salad with colorful vegetables, tossed in a ginger sesame dressing, is perfect a healthy snack, side dish or light meal. Cook the quinoa according to the package directions; set aside to cool. In a large bowl, whisk together the olive oil, sesame oil, rice vinegar, ginger, sesame seeds, soy sauce and honey. 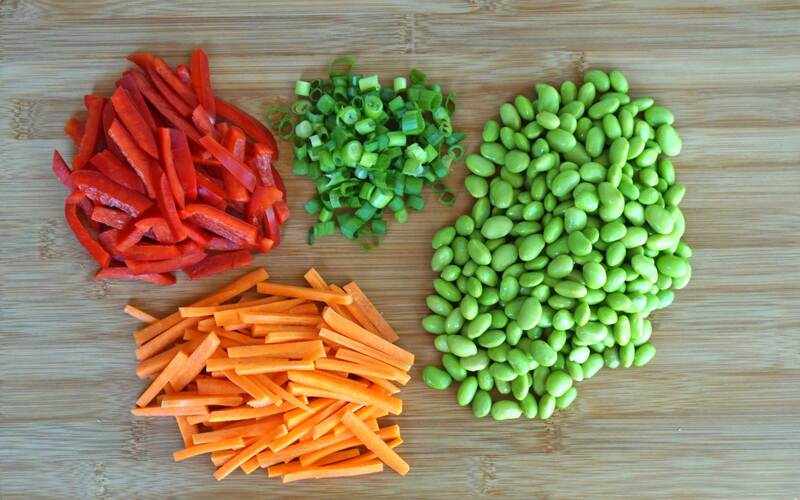 Add in the quinoa, edamame, red bell pepper, carrots and green onions and toss to combine. 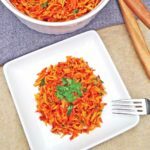 This entry was posted in Healthy Snacks, Main Dishes, Salads & Sides and tagged Asian, carrots, dressing, easy, edamame, ginger, gluten free, healthy, light, Lorissa's Kitchen, main course, quinoa, red bell pepper, salad, sesame, side dish, snack, vegetarian. sounds like the perfect salad to have on a hot summer day. Can not wait to try it. Thank you so much for sharing. Delicious salad, such a great Asian taste. I love quinoa salad.Thanks Joy, for giving yummy recipe. What a great salad joy!! I have made something similar…but not with the Asian Flare!! Yum!! Thanks for sharing on My 2 Favorite Things on Thursday!! Hope to see you again tomorrow!! Pinned! Easy and tasty! Count me in! Thank you so much for sharing with us at Merry Monday. We hope you’ll come to the new party. 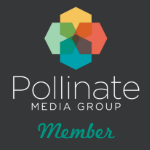 We’re celebrating our anniversary with a big Giveaway. Wow, this is an incredibly delicious dish! 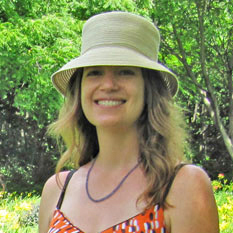 Entered the contest and would love to experiment with those food product regardless! Ive never seen the Larissas kitchen products, but those look so tasty Im going to go find them! I never heard before about Lorissa snacks… Your salad looks amazing!! This looks quite tasty! Thanks for sharing on the “What’s for Dinner” link up! Looks tasty! Love Asian fare! Thanks for dropping by http://image-in-ing.blogspot.com/2016/04/worlds-best-meatloaf-recipe-wordful.html to share. I’m not really the biggest quinoa fan, but this does look good! this salad looks so fresh!! I havent tried Lorissa Kitchen snacks before, I am going to keep a look out this week! That ginger dressing has my mouth watering. 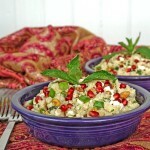 Love that you created a wonderful dish using healthful snacks. Quinoa is my “go to” grain. Love it and it’s versatility. This looks so good, and quick! My favorite combination. I’ll definitely have to give it a try! Such a wonderful salad Joy! 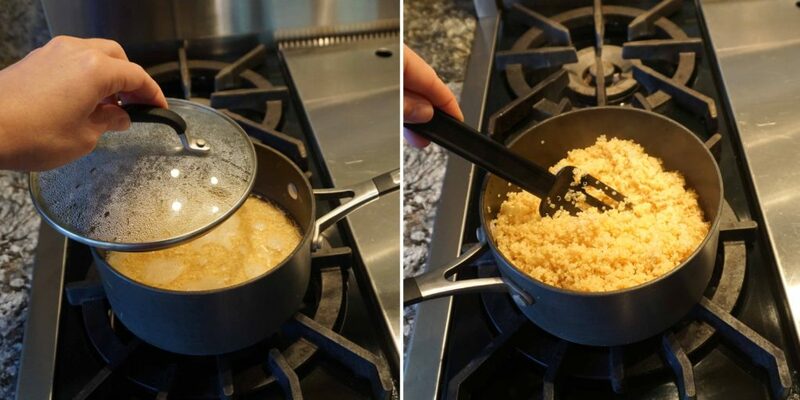 We eat a lot of quinoa, and we’d love to try your recipe. Especially when it contains edamame. It sure sounds super delicious. This looks so good and easy! Such a great way to use quinoa. 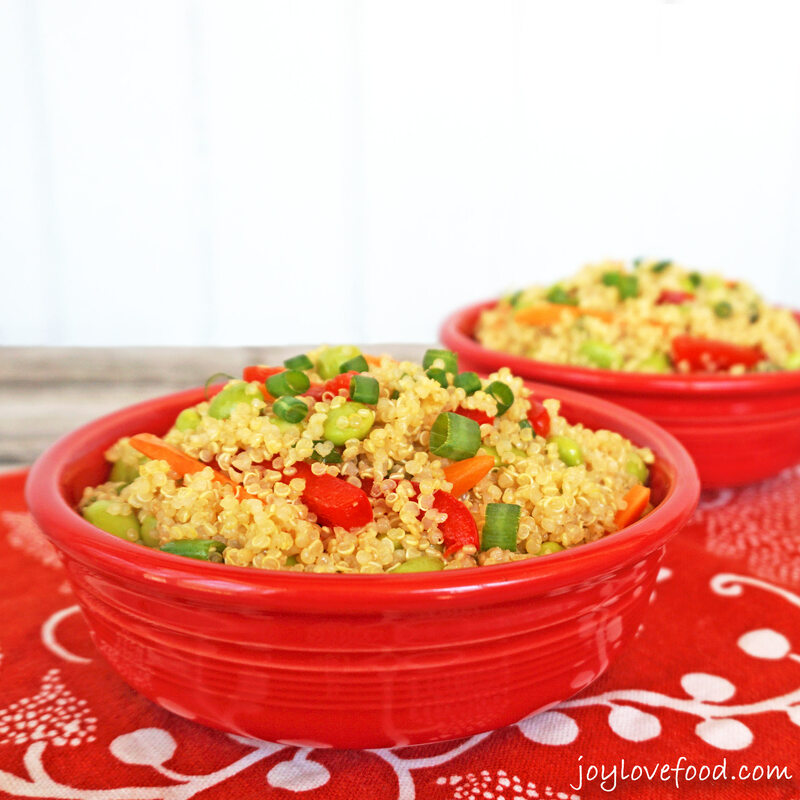 This quinoa salad is packed with flavors! 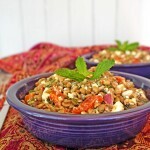 Perfect for a light meal especially now that days are warmer! I hadn’t heard of this product before. I’ll have to look out for it. I do love me some quinoa salads! This quinoa salad looks delicious. I love all those flavors. I just bought Lorissa’s Kitchen jerky today. It is really good and it’s good to know it’s made with responsibly raised cows/pork. 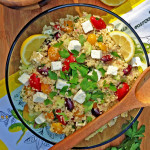 Joy – I’m such a fan of quinoa salads, they’re always light, wholesome and nutritious. I love your Asian Quinoa Recipe and I want to give this a try. Looks scrumptious! This quinoa salad seems like the perfect compliment to the beef strips. Great on-the-go snack combo! Thanks Stacey, they are indeed so good together and perfect for on-the-go snacking! Beautiful! 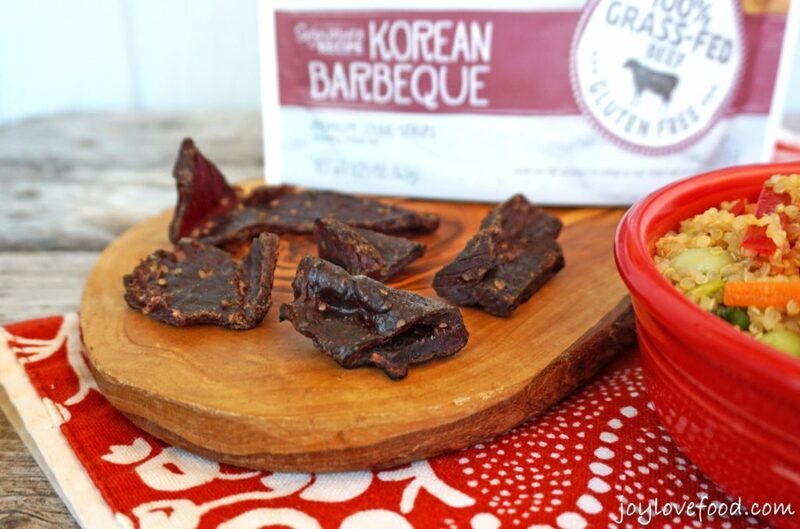 I love a good quinoa recipe and that Korean BBQ jerky looks amazing! Thanks Linda, they are both really good and are so good together! The Asian taste makes this delicious! Nice change. Linda recently posted…A Recipe for a Grilled Cheese Sandwich? Thanks Linda, it is a really delicious salad!